UD senior Michelle Francis presents her Summer Scholars research. When she graduates, she plans to work as a medical technologist for a year before pursuing graduate school or medical school. 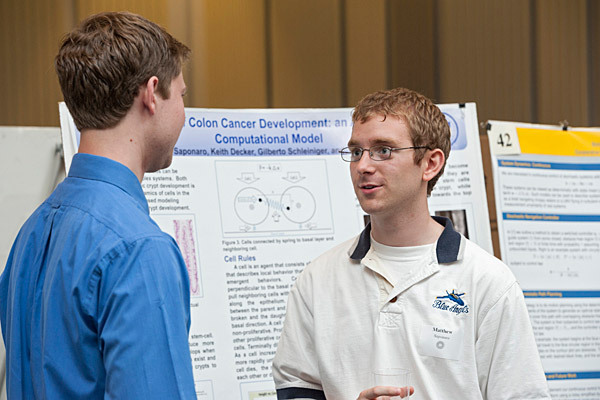 Matthew Saponaro, a junior in computer and information sciences, is developing computer simulations of colon cancer working with his adviser, Keith Decker. 1:12 p.m., April 26, 2012--You could hear the excitement in Michelle Francis’s voice as the University of Delaware senior described her research in the Department of Medical Technology to crosslink snake venom protein to melanoma cells. The viper venom has been shown to halt cells of melanoma, a particularly aggressive cancer, from metastasizing, or spreading. Peptides called disintegrins in the venom appear to block cancer cell migration, and Francis is working to find out how, as a member of the research team of Mary Ann McLane, professor of medical technology. Once she completes her degree at UD, Francis plans to work as a medical technologist and then either continue on to graduate school in pharmacology or attend medical school. “I’d like to work for a year first,” she says. ”It’s behind-the-scenes detective work  I really like it,” she notes. At the Trabant University Center on Friday, April 20, Francis was one of about 90 Summer Scholars who presented posters on their research projects from last summer. 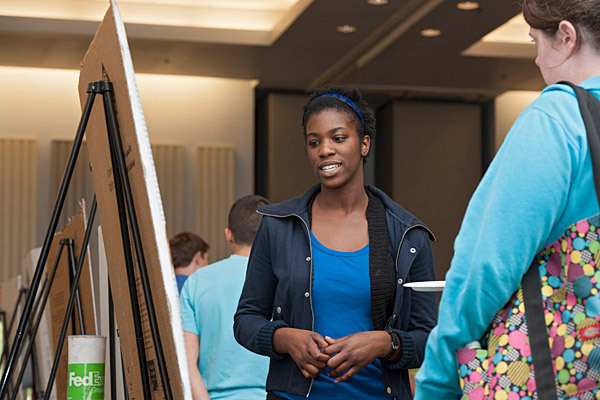 Some students had continued on with the research over Winter Session, while others will revisit and expand their projects in the summer sessions ahead. Such hands-on research opportunities propel students on paths to future careers and sometimes even to new fields of science. Melissa Ehrich, a senior majoring in food science from Fair Lawn, N.J., described her research to assess the effects of ozone, mild heat, organic acids and thymol on the quality of green onions and blueberries. She found that eco-friendly, organic washes such as citric acid had a comparable reduction in salmonella bacteria to the chlorine-based solutions currently in use. Ehrich is now looking forward to a summer internship at International Flavors and Fragrances (IFF) in South Brunswick, N.J., one of the global company’s locations. She wants to work in product development. Matthew Saponaro, a junior majoring in computer and information sciences from Wilmington, Del., also wants to pursue a career in medicine, but not through the usual routes. His mom is a nurse, and family and friends have been urging him to become a doctor. However, Saponaro can’t stand the sight of blood. This past summer, Saponaro combined his knowledge and skills in physics, biology and statistical analysis to develop computer simulations of colon cancer and its dynamics. He is merging these multiple disciplines into “agent-based modeling,” in which computer simulations “match up exactly to what we see in nature,” he says. Then he is coupling those simulations with probability theory. Lynnette Overby, faculty director of the Office of Undergraduate Research and Experiential Learning, kicked off the event, and Mark Barteau, senior vice provost for research and strategic initiatives, gave welcoming remarks. Barteau noted that he frequently receives emails and research magazines talking about the crisis in attracting more students to the science, technology, engineering and mathematics (STEM) fields. “You are the latest in a long line of research scholars at the University of Delaware,” Barteau said, congratulating the students. He noted that the University has a steadfast commitment to their education and training in research, as evidenced by the Interdisciplinary Science and Education (ISE) Laboratory, now more than mid-way through construction. He urged the students to continue their explorations. “It’s not just about the specifics of your research, but learning how to think, advancing the boundaries of knowledge,” Barteau said.